CBD is one of the fastest growing industries in the USA right now. In part, this is due to recent legislation that has enabled more people than ever to participate in the CBD industry and try it for themselves, but the majority of it is due to the sheer amount of people that were using it anyway and are now able to find it legally. Though we are still a ways off complete legalization, CBD is being sold in all manner of different websites and, brick and mortar establishments. One such retailer is 4 Corners Cannabis, a Colorado-based CBD supplier that is becoming one of the latest and greatest places to get CBD. Let’s take a look at their CBD products and evaluate whether or not they’re worth buying. 4 Corners Cannabis is so named because of their location in the Four Corners region, which is the only spot in the USA where four different US states meet at one point. This central location allows them to be able to sell to a variety of different states – although the laws on CBD usage vary from state to state. But as there is no border control between states, those who want CBD in a state where it is not legal can simply drive over to Colorado, where it very much is. 4 Corners Cannabis is a unique retailer because of the extensive quality control they provide for their products. This is possible because of the fact that they grow their own hemp. By being able to control the entire process from seed to harvest, they are able to carefully monitor each and every element of what goes into their products. Unlike a few less reputable CBD retailers, 4 Corners Cannabis seems determined to make sure you are making an informed choice when you buy their products. A ‘CBD Science’ section is featured very heavily on their website, offering all kinds of scientifically backed information about the merits and uses of CBD and hemp products in general. What’s more, their FAQ condenses all this science down to a few easily readable tidbits, to help inform a prospective buyer and make sure they know what they are getting into. Besides a clearly labeled products page and at least some kind of indication that they care about you as more than just a customer, one of the most important things for a CBD retailer to have is a clearly labeled lab reports section. Though many people gloss over this part, it is vital to ensure that the CBD you are buying has been certified legitimately from an independent laboratory. However, 4 Corners Cannabis’ lab reports come with additional information that actually identifies the primary aromas within sampled batches, as well as testing each individual product to ensure it is precisely what it says it is. Let’s examine a few of their products and find out what makes them so unique and different from other CBD retailers. 4 Corners Cannabis’ primary product is their CBD Oral Tincture, which contains only MCT Oil, CBD extract and limonene, which is a naturally occurring terpene found in citrus fruits. This makes the flavor of their Oral Tinctures entirely natural and pleasantly citrusy. Making for a more enjoyable experience than with some other, more natural flavored CBD Oils. The first two options are actually the same physical liquid content, meaning that the only thing that changes between them is that the 2nd option offers twice as much CBD, so this is a perfect choice for those that require a higher dose. Their prices and sizes are clearly labeled, as well as a long list of instructions and advice to make the entire experience of taking their CBD tinctures a great deal easier. The flavoring and inert oil used in their CBD tincture is what is commonly used by many other retailers, but some people can be allergic to limonene, as well as coconut oil. For those people, 4 Corners Cannabis offers an Avocado Oil Tincture. Their version, which contains the same amount of CBD in precisely the same ratio, is made using virgin organic avocado oil. Allowing for an earthier, if somewhat more bitter flavor. This option actually costs precisely the same as their regular CBD tincture; only they don’t actually provide you with the choice. With the regular CBD tincture, you can choose your size and intensity, as well as the desired price, but with the Avocado CBD Tincture, you can only select the very largest option for $199.99. Whether this is a bug or just because they only want you to be able to get it in the largest size is unclear. Though it is slightly weird that the product page contains an image with many different available sizes of avocado oil. Finally, they also sell another variety of their CBD tincture that contains no Limonene and is intended for pets. What’s strange is that buying their pet tincture is significantly cheaper for the exact same amount of CBD, making it seem far better to actually buy yourself Pet Tincture than to use their regular CBD tincture. It isn’t clear whether or not it is a pricing error, but considering that the CBD content between both the Pet Tincture and the CBD tincture are precisely the same…why would anyone buy their CBD tincture? What about other application methods, however? Does 4 Corners Cannabis sell any other method of imbibing CBD, or is it just their CBD tinctures? 4 Corners Cannabis also offer a CBD Salve, which is made from a composite of both coconut oil and beeswax. It is enriched with antioxidants and terpenes for flavor, as well as the requisite CBD extract. However, unlike with their CBD tinctures, 4 Corners Cannabis do not offer any kind of information as to the actual CBD contents of their product. The provided image insists that it contains 500mg of CBD and Vitamin E, but nowhere on the actual product page is that information provided. Additionally, though the rest of their products are accompanied by a suitably intensive and thorough lab report, their CBD Salve lacks an accompanying report, making the actual veracity of their claims somewhat doubtful. It is frustrating to visit a retailer with such a stellar reputation and such excellent information, only for it to fall short on their CBD topical products. 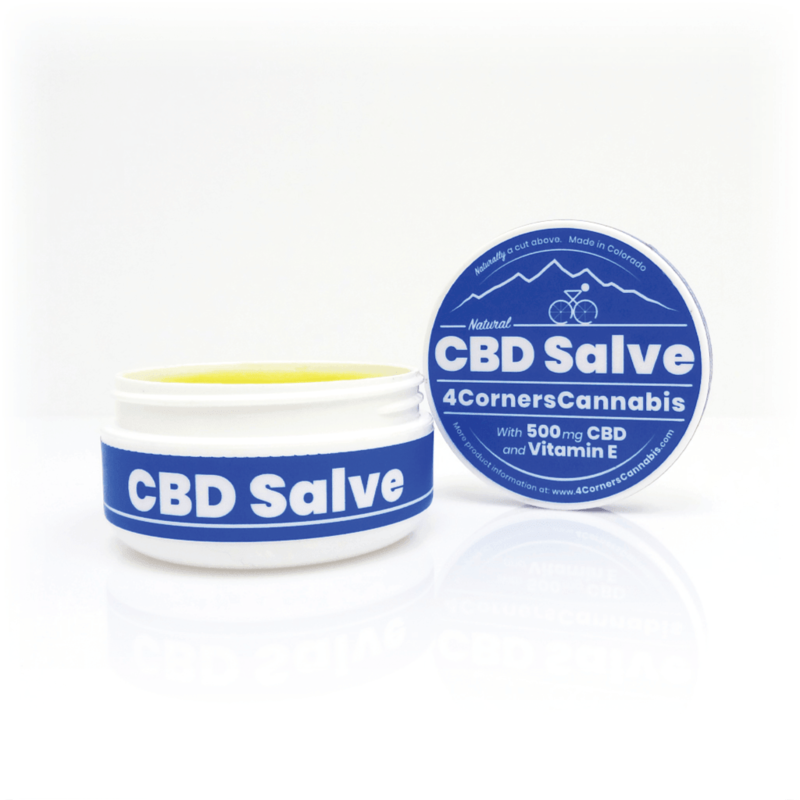 While it is likely that 4 Corners Cannabis’ CBD Salve is effective, it is absolutely vital that they be upfront with their scientific information and verify that it is real. Surprisingly, despite the excellent reputation of 4 Corners Cannabis’ CBD Tinctures, there are no other products available for sale on 4 Corners Cannabis. At least, no other CBD products. The only other thing available for purchase are some t-shirts – if you can believe that. Each shirt comes emblazoned with their rather unique, owl-like mascot and is available in Green, Light Blue or Navy. Each shirt costs the same amount of money, $19.99, no matter the size you pick, and they do actually look like high-quality t-shirts despite their 100% cotton content. However, it is pretty weird to expect new users of 4 Corners Cannabis to buy t-shirts with their logo on them, especially when they don’t really offer any kind of significant diversity in their products. 4 Corners Cannabis is a bit of a weird example of a CBD retailer. They come exceptionally well recommended, with many users on such third-party sites, like TrustPilot, praising 4 Corners Cannabis for their CBD tincture’s quality, as well as their excellent customer service. However, if you want to buy something other than CBD tincture you are out of luck. Besides the CBD salve, which has no actual information anywhere on it, and a few t-shirts, 4 Corners Cannabis only sell CBD tinctures. It isn’t entirely a terrible thing, as there is nothing inherently wrong with specializing in CBD oils and nothing else, but it would be nice to have a few options available for those that can’t or don’t want to take a CBD tinctures. The most annoying thing about the 4 Corners Cannabis website is the fact that their CBD tincture has so much information, so much useful lab report data and scientific backing, yet the CBD Salve doesn’t have anything of the sort. When it comes to laboratory investigation, it is best to be as consistent as possible. However, this annoyance in their lack of consistent scientific reporting, coupled with the strangely random pricing choices on their products, doesn’t in any way negate the value and integrity of 4 Corners Cannabis. Though 4 Corners Cannabis has made a few strange choices in both their website and their pricing, the fact remains that their CBD is extremely well reviewed, as well as significantly supported by scientific evidence. It seems that 4 Corners Cannabis is merely focused on their primary products, their CBD tinctures, and basically just ignore everything else. As long as you are only looking for a new CBD oil to try, give 4 Corners Cannabis a go and see for yourself whether or not, their seed-to-harvest style of homegrown hemp is everything it claims to be.